nose wheel legs and fixed wing landing gear. 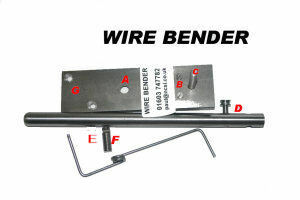 A very easy to use and a versatile tool for shaping all wire up to 8 gauge. 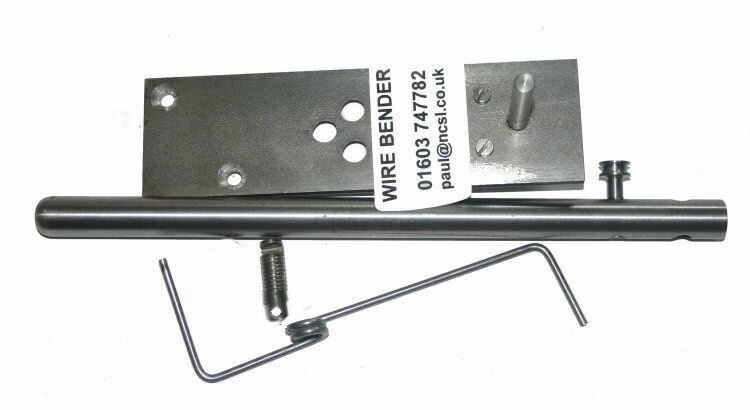 Screw ( B ) is the wire support screw which can be used either side for clockwise or anti-clockwise bends. The peg ( C ) is the main former and handle support peg. The handle ( D ) is both the handle and the outside former. The double ended clamp ( E / F ) is for holding the wire. 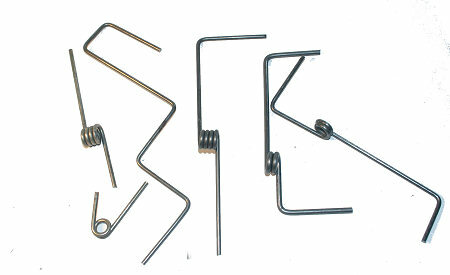 ( E ) allows the wire to be locked when forming a spring and ( F ) can be used for normal bends. To form a nose wheel spring leg. Place the clamp ( E ) into the hole ( A ) with the wire between the former post ( C ) and the screw ( B ). Slide on the handle ( D ). Ensure you have enough wire pulled through to create the spring (depends on number of turns, normally 3 or 4 ) plus addition length to form the right angle later for the axle. Tighten the clamp ( E / F ) JUST enough to prevent the wire from moving. Slowly pull the handle around the former peg and lift over the clamp screw. Do this the number of time required for the spring. Once complete, dismantle. To form the right angle for the axle, use the other end of the clamp ( E / F ) lightly and place the wire into the same position against the former post and screw. Now form the right angle. Do the same on the other end to form the part that will fix to the firewall. With a bit of planing you should be able to make almost any sort of undercarriage parts. Even for retracts! or via credit card with Paypal. Orders for outside UK please choose Overseas Postage option Item will NOT be dispatched if the additional is not included.